For the chops, whisk the red wine, 80ml (1/3 cup) olive oil, mixed herbs and garlic together. Pour it over the lamb chops, cover and refrigerate to marinate, at least 20 minutes or overnight. Preheat the oven to its grill setting. For the purée, place the cauliflower florets in a steamer basket set over a pot filled with a little simmering water. Cover and steam, 5 – 6 minutes, until fork-tender. Heat the butter and 5ml (1 tsp) olive oil in a pot over medium heat. Add the leeks and the garlic and sauté, 5 minutes. Stir in the fresh cream, mustard and Parmesan, and simmer, 2 minutes. Combine the mixture with the steamed cauliflower and blitz to a smooth purée. Season to taste. Remove the lamb chops from the marinade and place on a roasting tray. Grill, about 10 – 12 minutes, until browned and lightly charred. For the gremolata, place all of the ingredients in a food processor and blitz until fine. 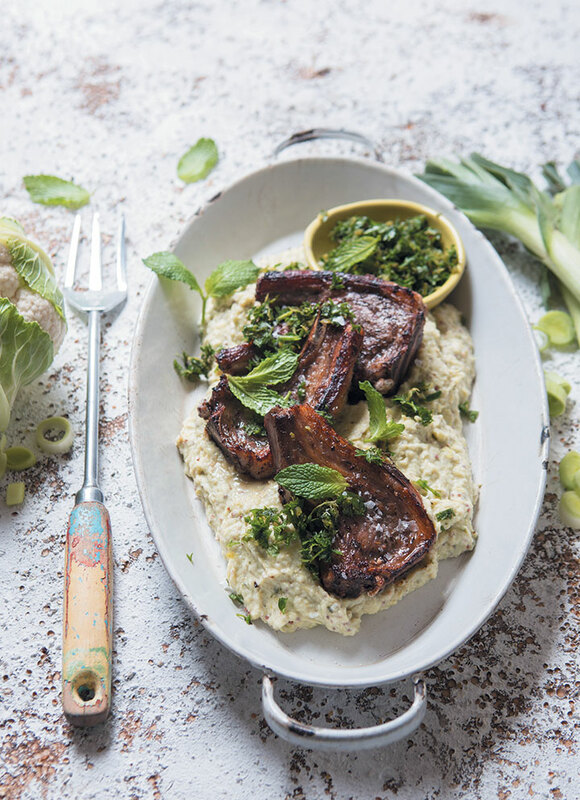 Serve the chops atop the purée and scatter the gremolata over. Garnish with a handful fresh mint or microherbs. The chops can also be done on the braai for a bit of an alfresco twist to your Easter meal. To turn the gremolata into a herb sauce, simply blend it with extra olive oil and a pinch salt and pepper until smooth.